Telecom stocks fell after Mukesh Ambani extended Reliance Jio’s free offers till March 2017. In a volatile trade, benchmark indices pared gains to settle on a lower note after initial rally dragged by telecom, banking and metal indices. India’s GDP, announced yesterday, grew lower than expected in the September quarter at 7.3% also affected the sentiment. Swinging between gains and losses, Sensex rose as much as 143 points during intra-trade before falling over 100 points while Nifty also broke it’s crucial 8,200 levels. 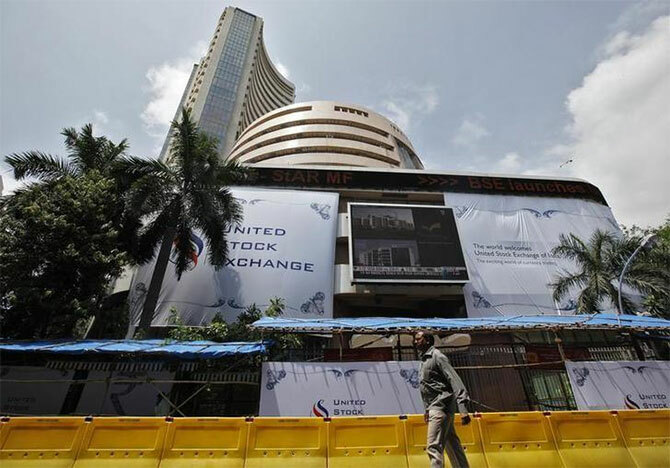 S&P BSE Sensex settled at 26,560, 93 points lower, while the broader Nifty50 was quoting 8,192, down 32 points. In broader markets, BSE Midcap fell 1.10%. "After a relief rally the market now turned to profit booking on the back of weak global market and the prolonged concern over domestic liquidity. The continued selling by FIIs is likely to pull the market to consolidation and at the same time investors are awaiting RBI’s monetary policy for taking further bet," said Vinod Nair, Head of Research, Geojit BNP Paribas Financial Services. Billed as Jio Happy New Year Offer, every new Jio user starting 4 December 2016, will get Jio’s data, voice, video and the full bouquet of Jio applications absolutely free till 31 March 2017. Post the announcement, Idea Cellular, Bharti Airtel and Reliance Communications (RCom) lost 2.2% - 4%. The BSE Telecom index ended 0.90% lower. GAIL was the top gainer on Sensex up 3.33% while PowerGrid was the biggest laggard, settling almost 4% lower. Metal index was the top sectoral loser with NMDC, JSPL, JSW Steel settling 3% lower. All stocks settled in red in the banking index which was dragged by ICICI Bank (2.38%), Federal Bank (1.77%), Kotak Mahindra Bank (1.59%) and Bank of Baroda (1.55%). Despite fuel price cut, aviation stocks SpiceJet and Jet Airways fell nearly 4% each on BSE Sensex. Shares of Indian jewellery stocks gain after reports of excise duty scrap on branded gold coins. Titan Co Ltd rises as much as 3.0%, Gitanjali Gems Ltd soars as much as 9.64% at intra-day. Shares of pharmaceutical companies settled 0.26% higher in an otherwise range-bound market after the Delhi High Court set aside the Centre’s decision to ban 344 fixed dose combination (FDC) medicines. Dr Reddys Laboratories, Sun Pharma, Lupin from the Nifty Pharma index were up between 0.73% and 1.26% on the NSE. Among other stocks, Eicher Motors has moved higher by 3.5% to Rs 22,434 on the BSE after the company reported 41% year on year (YoY) jump in total sales at 57,313 units in November 2016. The motorcycle and commercial vehicle maker sold 40,769 units in the same month last year. Shares of companies engaged in oil exploration & production related business have rallied by up to 15% on the BSE in intra-day trade as oil prices surge 10% after the Organization of the Petroleum Exporting Countries (OPEC) agrees to cut output for first time since 2008. Oil & Natural Gas Corporation (ONGC) hit a 52-week high of Rs 299, up 3.5% in intra-day trade, while Oil India was up 3.8% to Rs 435 on the BSE. Oil swept to a six-week high on Thursday, lifting energy shares in its slipstream, after OPEC agreed to cut crude output to clear a glut, while bond yields rose on prospects that resulting inflationary pressures will lead to higher interest rates. European stocks slipped into the red, however, shrugging off the bounce in Asian shares and following Wall Street's slight decline the previous day instead. The STOXX 600 was down 0.3% by 0824 GMT, having climbed to its highest level since November 10 in the previous session. Japan's Nikkei ended at its highest since last December on Thursday, led by mining stocks after OPEC agreed to cut crude output for the first time since 2008 to support oil prices, while a weak yen lifted overall sentiment. The Nikkei share average gained 1.1% to 18,513.12, the highest closing level since Dec. 30, 2015.